Sometimes it’s fun to begin with a colorful background, place inked specimens on top of the inked background, and pull a print. The square shape was created by taping the shiny side of Reynold’s Freezer Paper in place to create a boundary to contain the strokes of the inked brayer. 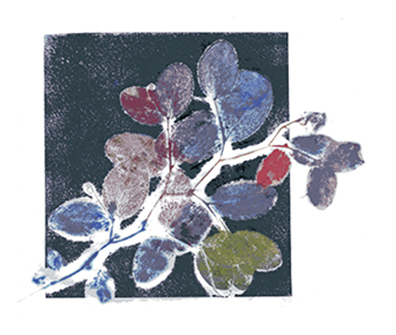 The image shown below is of my first monotype, made during Sonja Larsen’s 2007 nature printing workshop. I found the twig on a walk in the woods that surrounded the now-closed family resort where about a dozen eager nature printers gathered to print and learn, celebrate the summer solstice, and have a memorable time.